I am cracking my head what should be my breakfast tomorrow. I have been neglecting the preparation of breakfast bakes the last two days as I was rather busy. Therefore, the kids have ended up having breakfast beverages with saltine crackers as breakfast for the past two days. 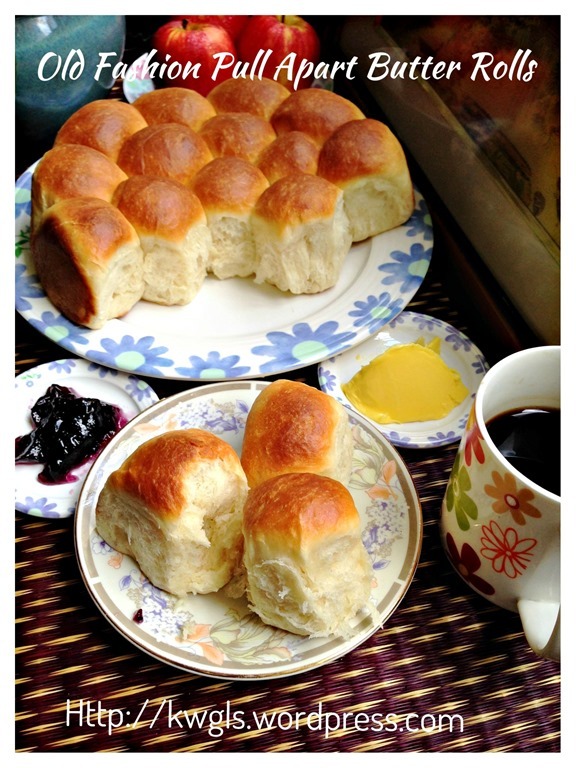 I am looking a simple bread recipe that I can prepare fast and easy. Since I have a bottle of coconut jam (kaya) in the my fridge, I have decided to locate some white bread recipe. Yes, I do have a lots of white bread recipes but I am also constantly looked out to try new recipes. 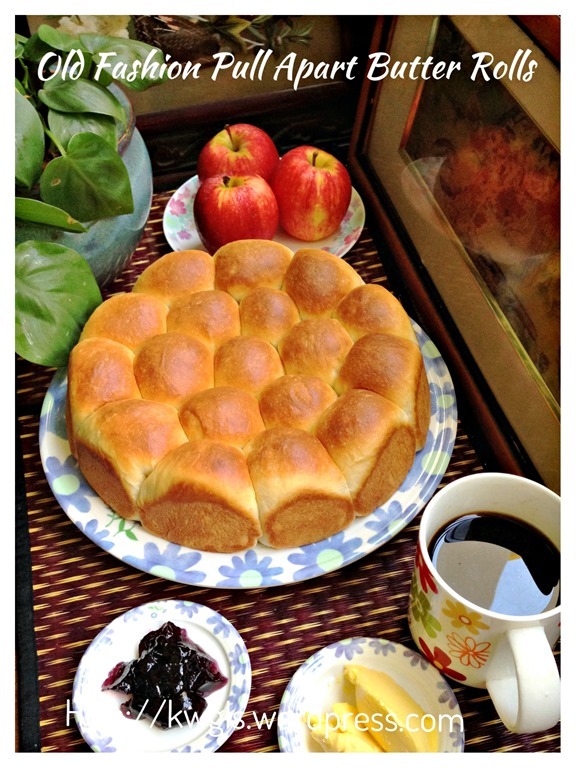 Suddenly it reminded me of the traditional bakery pull apart bread rolls, a rather classic simple bread that goes well with jam and butter. 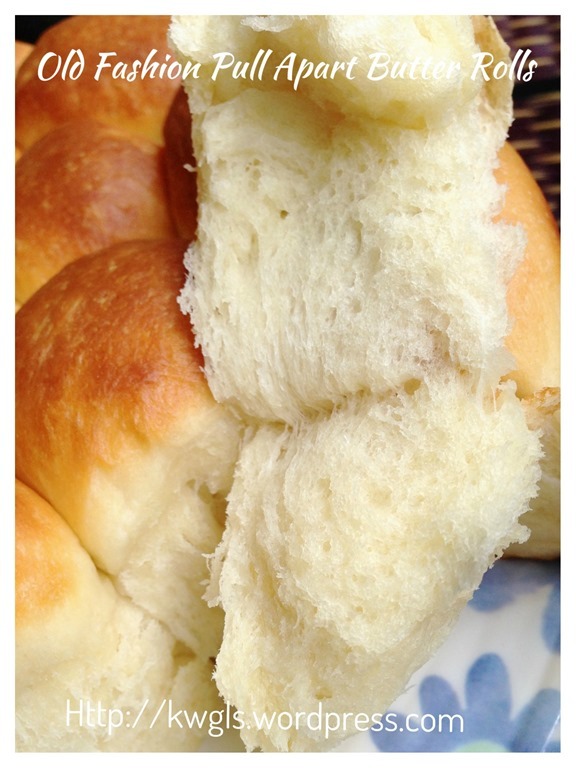 The first recipe that appeared in my searched list is this golden pull-apart butter buns from King Arthur Flour website. 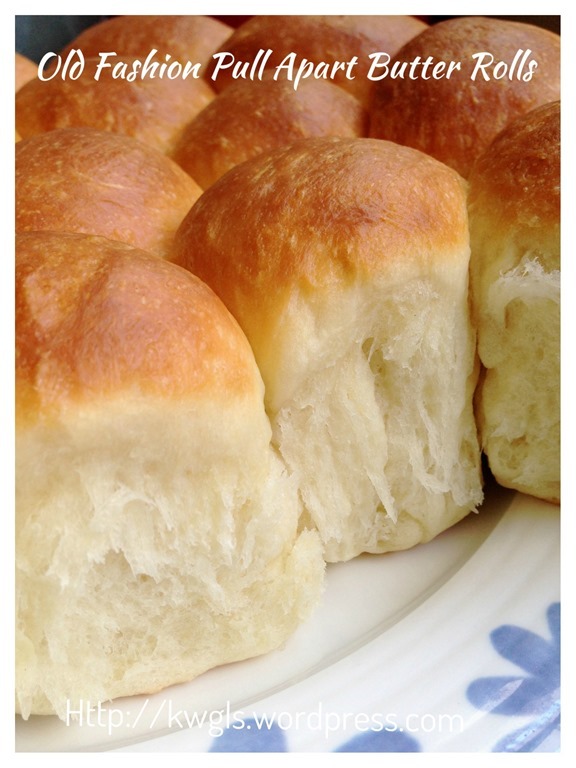 I looked at the picture and it is very “seductive”, appeared to be a very soft bun. Therefore, I have decided to try it out. 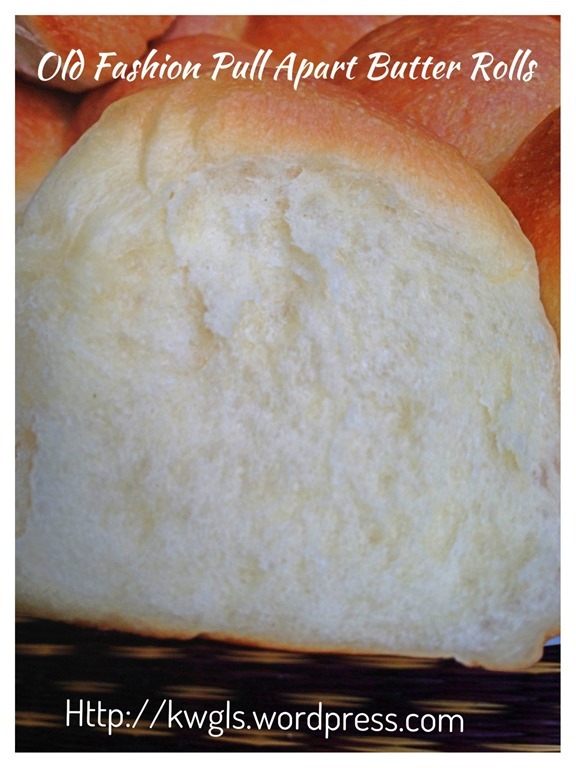 Hmmmm…., I should say this is a rather classic bread recipe and nothing much to shout about. Ingredients and preparation are rather simple and standard, no long hours of overnight proofing and no excessive use of yeast. 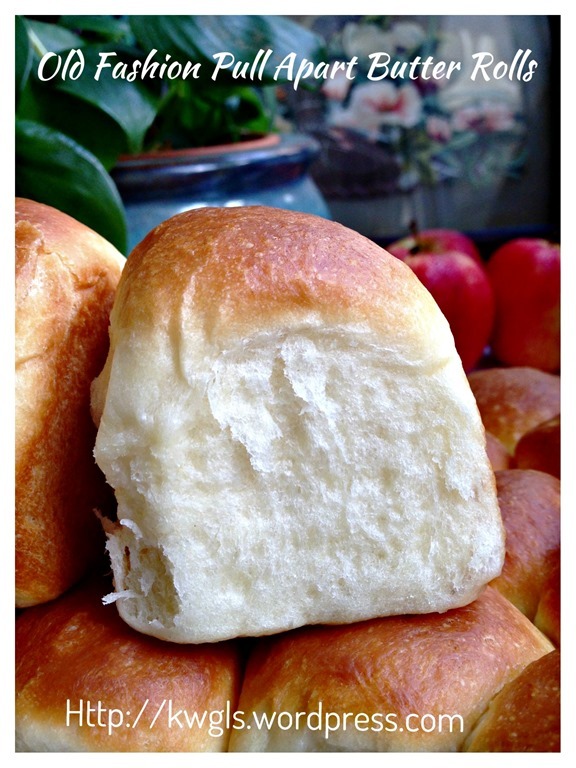 Taste is rather basic and it really reminds me of the traditional bread rolls that I have been eating when I was young. Preparation is rather fast especially in Singapore and Malaysia’s hot weather and it took me about 2 hours to get ready the buns. Lightly greased a 9 inches diameter round baking tin or any desired tin. 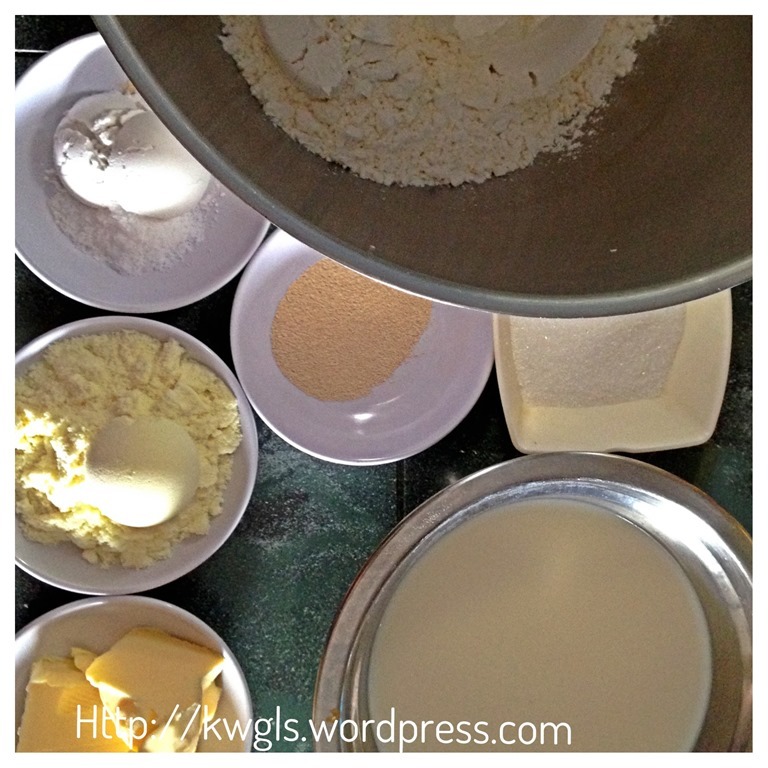 In a mixing bowl, mixed all the ingredients (except butter) together. Use a spoon to slightly stir it until it form a sticky dough. Use the dough hook in the machine to beat the dough at medium to low speed (speed 2 in Kenwood Chef or Kitchen Aid) for about 5 minutes. Add in 50 grams of butter and beat the dough at medium to high speed (speed 4 in Kenwood Chef or Kitchen Aid) for about 7 minutes until the dough is smooth and leaves the side of the mixing bowl. Transfer the dough out to a lightly flour surface. Lightly knead for 1-2 minutes and let it proof until it double in size. Cover the dough with some clingy wrap. After the first proofing, transfer the dough out and divided equally into 18 portions. 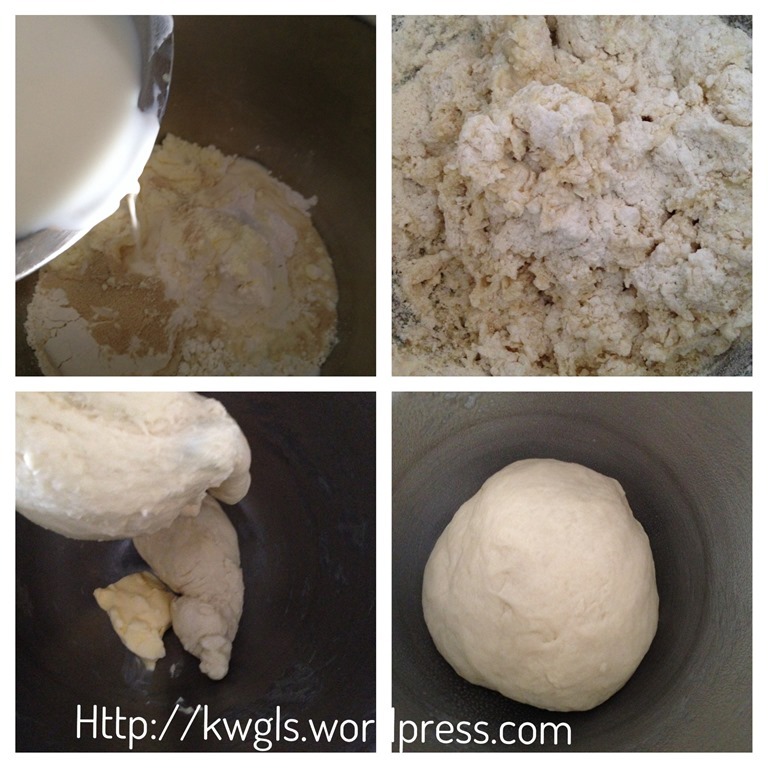 (Each portion of this dough is about 50 grams). 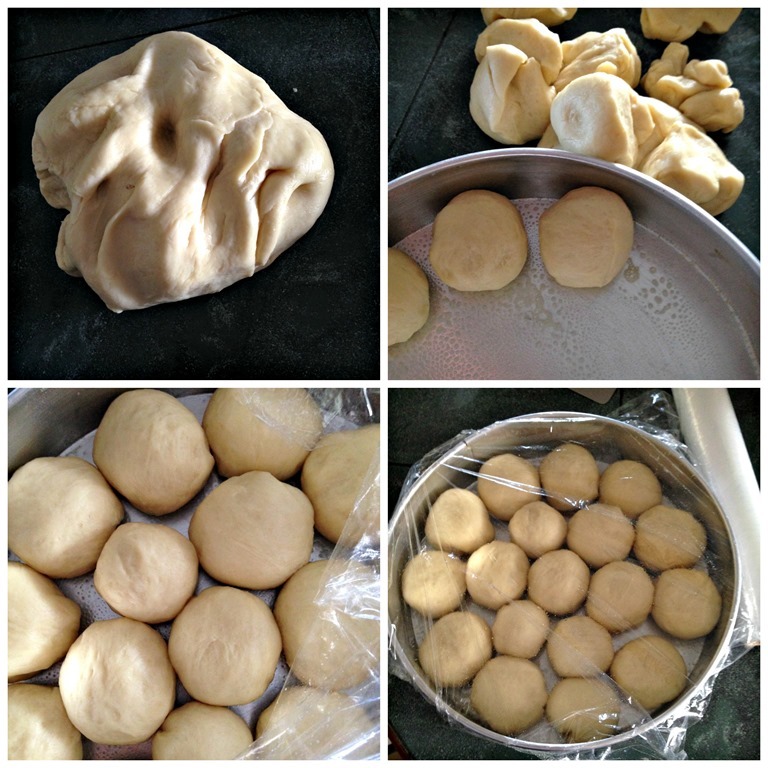 Shape the dough into a round ball and arrange in the round baking tin. Cover the tin and let it proof until double in size (about 40 minutes depending on day’s weather). When the dough is almost ready, pre-heat the oven to 180 degree Celsius. Once it is ready, bake in the oven at 180 degree Celsius for 20-25 minutes or when the aroma of the bread starts to permeates the house and the top turn golden brown. If you prefer, use an oven thermometer, insert into the middle of the buns, as long as the internal temperature reaches 90 degree Celsius, the buns are considered as cooked. 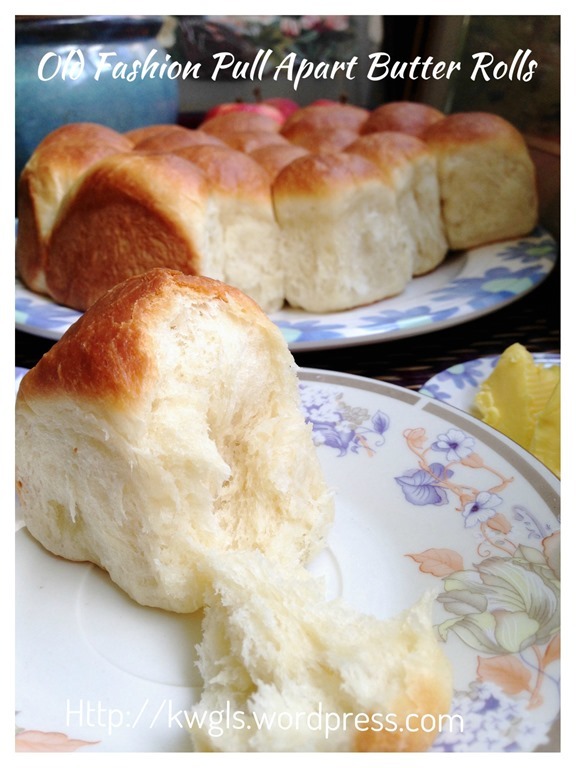 While the buns are hot, brush with melted butter sparingly. Transfer out to a cooling rack. 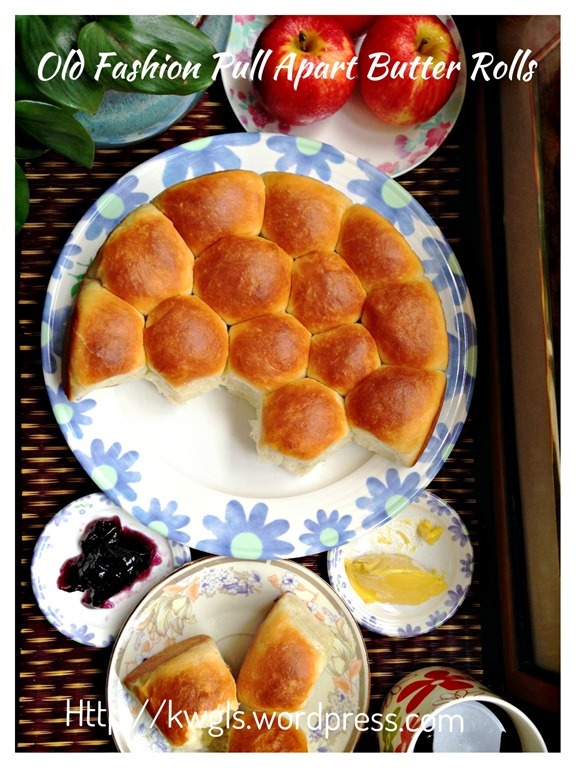 Cooled completely before serving as bread rolls for breakfast or teatime. 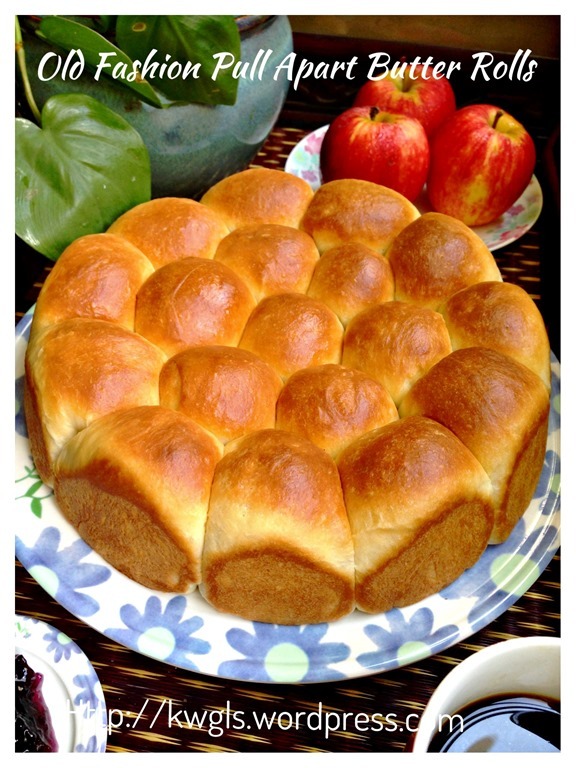 I am sure you can concur with me that this is a simple basic pull apart bread recipes. 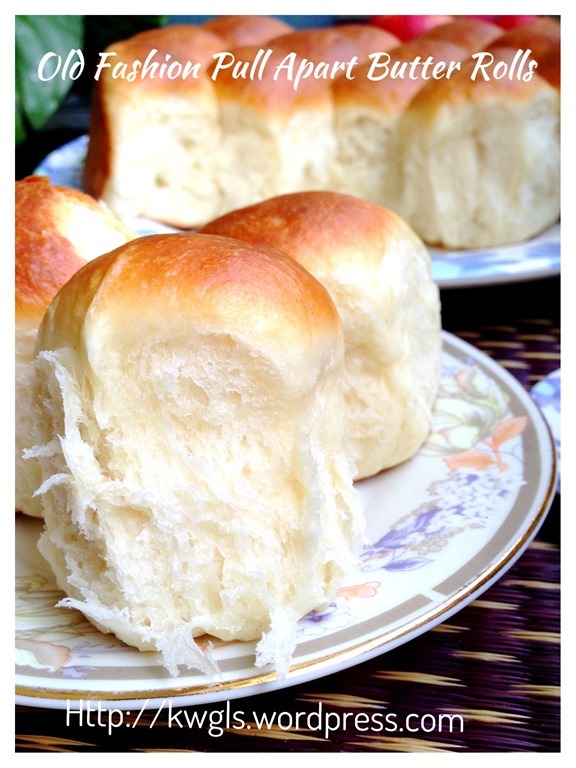 Variations are many, you can always sprinkle with white sugar, cheeses on top of the proof dough before baking and transform it into a sugar pull apart bread or cheese buns. Feel free to explore with this basic recipes with side ingredients that your family prefers. Hope you like the post today, Cheers and have a nice day. You can also join the FOOD BLOGGERS AND FOODIES UNITED FACEBOOK GROUP to see more recipes. 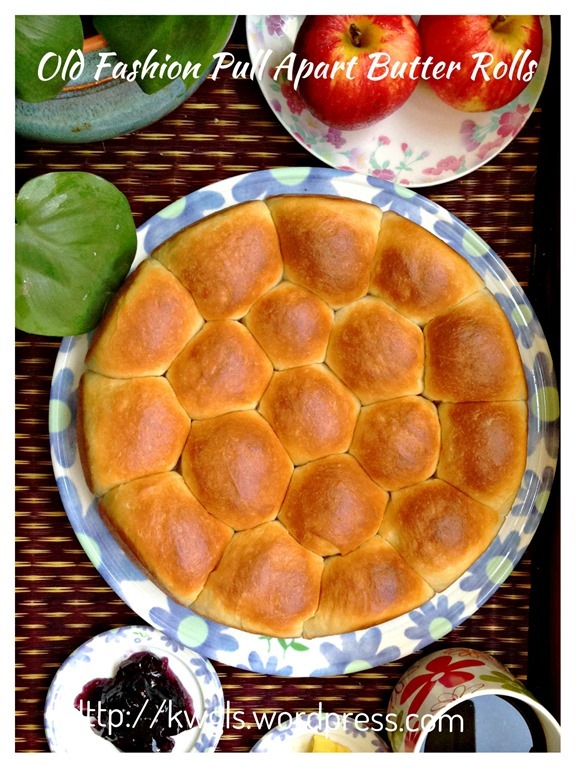 Currently there are about 7,900 members sharing various food photos . I am posting my daily home cooked food in the above Facebook Group daily. I would be more than happy if you can post in the Group for the recipes that you tried from my blog. 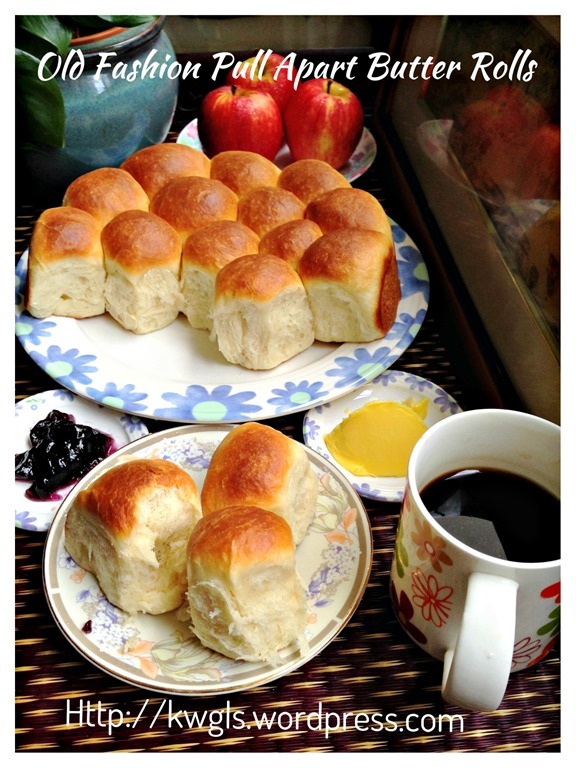 This entry was posted in Breads and Pizza, Food Preparation Series and tagged 8, butter dinner rolls, butter rolls, dinner rolls, guai shui shu, Guaishushu, kenneth goh, postaday, 古早味牛油餐包，牛油餐包，传统牛油餐包， 餐包， Old Fashion Pull Apart Butter Buns ， classic pull-apart buns. Bookmark the permalink. Oh dear, I miss out the corn flour, will there be any impact? now 1st proofing. 1) my 1st proofing,double size but cannot make 18pcs of 50g. I only have 15pcs of 20g. Is it not proof long enough? 2) I see your top of bread, smooth, mine not. I even added sugar on top before bake. The gross weight of the ingredients is definitely more than 15 pcs x 20 grams = 300 grams. Flour alone is 400 grams not counting in other ingredients. Is it possible that you have measured wrongly? If you have added sugar on top, it will never be smooth… Hope it helps and thanks for trying. Hi hi! Can this bread be made without a Kitchen Aid? Hi. The bread looks beautiful! Can I omit the milk powder and if I were to roll fillings into the dough ( like coconut, gula Melaka etc) will it reduce the fluff of the bread ? 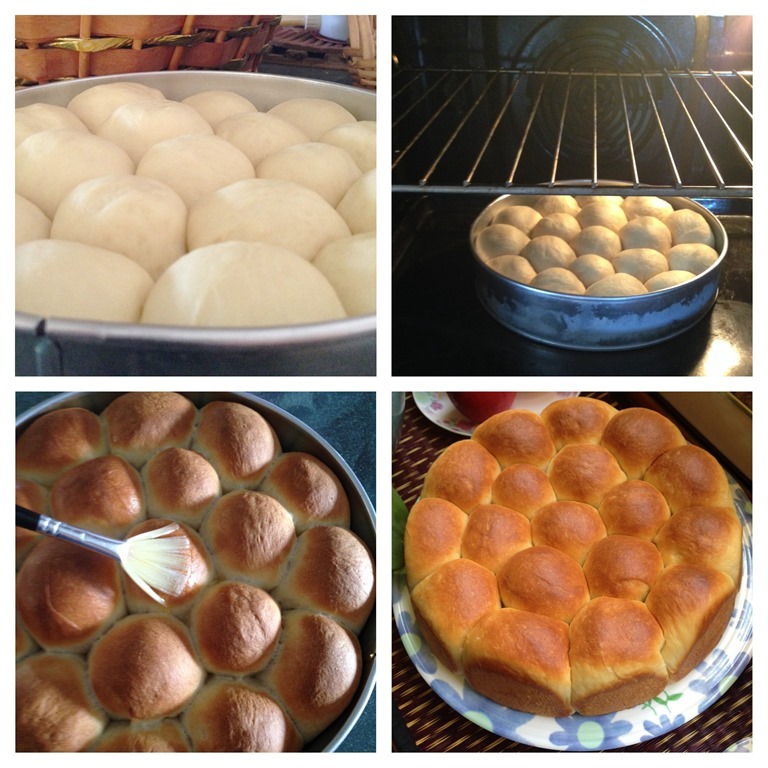 I have just make the buns. 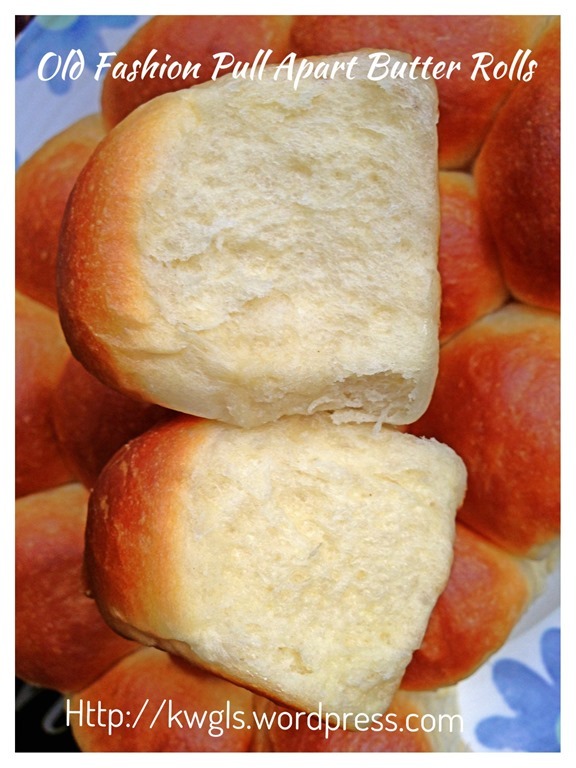 The top of your buns are smooth and soft, but mine was a little bit hard and crispy. Anything went wrong? Oh, one more question. Can I bake it in the bread tin to make it like loaf? One thing i was so curious, why did you put the baking tray at the bottom of the oven and not on the rack? (as per your picture). I followed exactly 🙂 Just wanted to know why. Thank you again for sharing this awesome recipe. the butter in all your recipes is salted or unsalted? Generally not advisable because plain flour is medium protein where as superfine flour is low protein powder. It can become slightly too soft for a bread. Hi Kenneth, how long should the 1st proofing takes? I totally forgotten about 1st proofing and immediately I shape the dough after taken out from the mixer? Will that affect the bun? Can you advice the oven mode I should be using – traditional oven(top n bottom heat) , convention fan, pastries (bottom heat)? Thanks . I am baking now, can’t wait to see the end product! Hi Kenneth, tried out the recipe today and it was lovely. My girl wanted cinnamon in the rolls and I made it into cinnamon rolls with half the dough. Turns out beautifully. I had just attempted this recipe of yours. The buns were soft and it had the pull apart streaky effect! But I did not manage to get 18 dough but 16 only with the weigh of +-50 grams each. Hi Kenneth, thanks for this very easy to make receipe. I have made it 3 times already. Was wondering if we could replace the plain flour with bread flour? Thanks. Hi can i use BM to do kneading n proofing ?